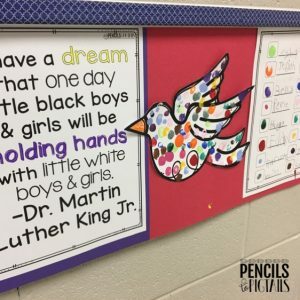 Hands up if you love studying Martin Luther King, Jr. with your students! I LOVE teaching my KINDERGARTENERS all about him. 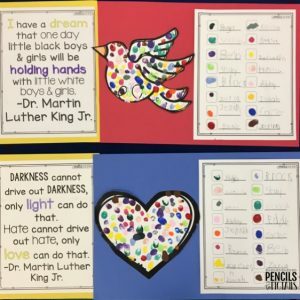 I’ve heard teachers say that 5 year olds aren’t old enough to understand the Civil Rights Movement but I strongly disagree. In fact, I KNOW for a fact that’s not true. I always start by gathering my students in a circle on the carpet. I tell them that we are going to learn about someone very important. We will learn about a man who changed the course of history. I share with them that some people think they are too little to understand what they will learn today, but I know differently. We do a couple of Scholastic weekly readers. I don’t discuss his death. We do discuss how white people used to sit on the front of a bus and black people were told to sit on the back. We also talk about how children went to different schools and even drank from different water fountains. They are so passionate about the injustice of it all. They scream out, “That’s not fair!” and “God made us all the same!” It’s adorable & the perfect reminder of why I became a teacher. 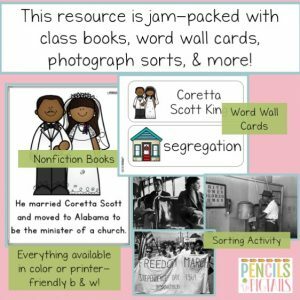 This year I created a new resource that will teach your students all about MLK, Jr. I’ve included class books which will help them gain a strong understanding of this important man. You can grab it on TPT by clicking on one of the covers below. 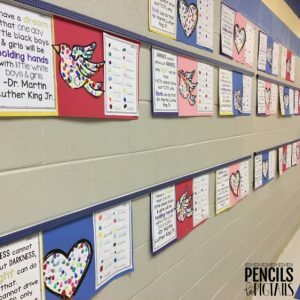 The world wall cards & real-life photos are perfect to help you start a discussion with your students. I LOVE how passionate my students get. We roll up our sleeves and look at all of the BEAUTIFUL skin tones in our classroom. We talk about how wonderful it is that we can all go to school together now. We discuss how brave MLK was to stand up for what he believes in. It always gives me chills. We used pieces from the resource to make a few meaningful crafts. 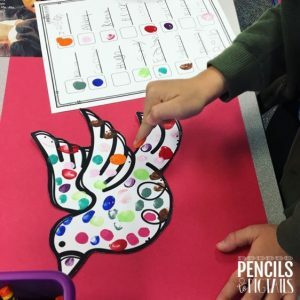 In the first picture in this post, you see the child pressing her finger in some paint (an ink pad would work great too). We strategically laid out the name sheet beside either a heart or dove on each child’s work area. Students were told to go around and write their name somewhere on every person’s sheet. When they finished, I let the students get out puzzles and called them over a couple at a time. I showed them how they would go around to every paper and put their fingerprint beside their name on the key & then about 5 times on each picture. I can’t believe how beautiful these are! We added a couple of different quotes on the sides (in the resource!). They were so proud of these. We also made these adorable earth crafts. We started by painting the earths. While those dried, the students took their time coloring & cutting out their “dolls”. I loved how these turned out too. 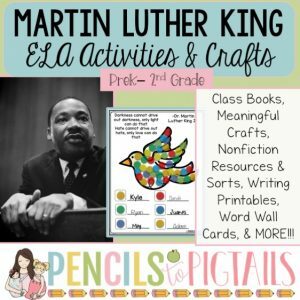 I also used many of these pieces in the resource to talk with my Parent English Class about MLK, Jr. Most of them did not know what he was famous for. We had a GREAT discussion. 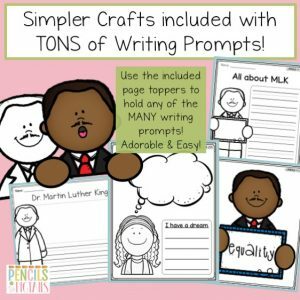 If you aren’t into the time-consuming crafts, there are some simple ones included as well – just click the picture below to see this resource in my TPT store. 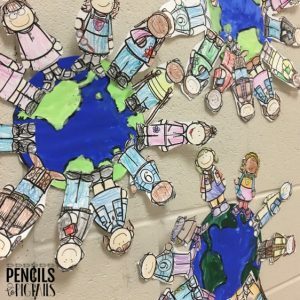 I hope you enjoy this resource as much as my students and I did. 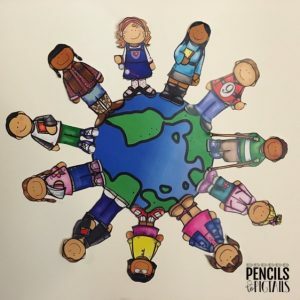 It’s never too early to help your students understand that every skin tone is a beautiful one.